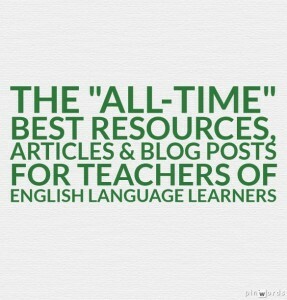 I’ve been posting annual lists of The Best Resources, Articles & Blog Posts For Teachers of ELLs for a number of years. In addition, I’ve also been publishing separate lists of The Best Websites For English Language Learner Students, which mainly focuses on self-access student sties. I thought it would be useful for readers, my students, and me to review them all and identify my choices for the “all-time” best ones for teachers. I’ll be following-up with one for students, soon. Later today, I’ll also be publishing the first post in a series on teaching ELLs over at my Education Week Teacher column, and wanted to share this resource there. I’ve begun creating a number of these “All-Time” Best list, with The “All-Time” Best Ways To Create Online Content Easily & Quickly being the first ; The “All-Time” Best Web 2.0 Applications For Education second; The “All-Time” Best Videos For Educators third; The “All-Time” Best Online Learning Games was the fourth one; The “All-Time” Best Social Studies Sides was fifth; The “All-Time” Best Science Sites was sixth; and The “All-Time” Best Places To Find The Most Popular (& Useful) Resources For Educators was number seven. Look for quite a few more “All-Time” Best lists over the next couple of months. There are nearly 1,300 Best lists now that are categorized and updated regularly. You can see them all here. I’ve included several of my “The Best” lists on this list. Those lists mainly link to resources developed by other teachers. For those topics, there are just so many excellent resources I just couldn’t pick one or two to highlight here. I have to start by sharing what I think are the Best Three Sites On The Web For ESL/EFL/ELL/ELT Teachers. These three sites provide large quantities of high quality resources for teachers and students, and they’re free. They’re my “go to” sites that I check check daily, and typically more often, to see what’s new. The Teaching English – British Council Facebook page. This site is probably the most popular — and deservedly so — site for ESL/EFL/ELL teachers in the world. Ann Foreman does an extraordinary job inviting and sharing resources from teachers throughout the world. EFL Classroom 2.0. I’ve posted countless times already about this site, and the great work by its founder, David Deubelbeiss. Ressources Pour Le College En Anglais is another site I’ve mentioned often. Michelle Henry does an incredible job of curating resources for students and teachers. I’m obviously biased, but I think the weekly posts I write for the New York Times Learning Network on teaching ELLs are one of the best resources on the Web for both students and teachers. You can see a list of them, with descriptions, here. ELT Chat and ELLchat on Twitter are excellent ways to learn from and connect with other English teachers. Readers of our book, The ESL/ELL Teacher’s Survival Guide, know that there’s a lesson plan in it helping students learn the qualities of a successful language learner and that they do a self-assessment as part of it. Part of that lesson includes use of The Best Videos Illustrating Qualities Of A Successful Language Learner. Marisa Constantinides has created a quiz called Are You A Good Language Learner (completely separate from our lesson), which would be great to give to students. And the EFL Smart Blog has turned Marisa’s quiz into an interactive one that could be taken online. It’s an excellent activity to use on its own or as part of our lesson plan. Kate Kinsella has a collection of hand-outs to assist in academic language instruction. I’m adding it to The Best Websites For Developing Academic English Skills & Vocabulary. Here are more. And one more batch. English Agenda is a site from the British Council which offers a wealth of language-teaching research and online professional development. Teaching English at the British Council features a “blog post of the month” from English teachers throughout the world. It’s a great collection. The entire Teaching English site has a wealth of useful resources. Maximising Learning in Large Classes and Teaching Large Classes are both from The British Council. 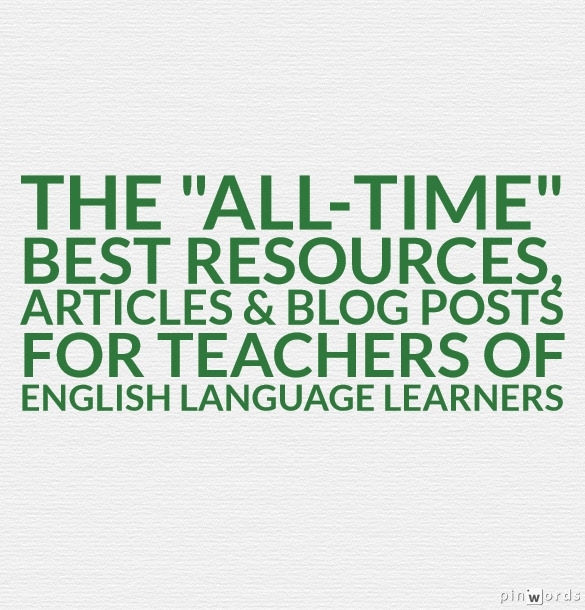 I’m adding them to The Best Resources On Teaching Multilevel ESL/EFL Classes. Alex Case has put together a list of his most popular blog posts/shared resources from the TEFLtastic blog. Sean Banville has an “empire” of nine excellent free websites that have to be bookmarked by an teacher of English Language Learners. Check them all out here. The steps community organizers use to help change people’s lives can help teachers improve English language learners’ reading. I was browsing Pinterest one today and came upon this page after searching “infographic language ell”. Wow, what a treasure chest of useful visualizations! I think the Peace Corps has developed some of the best materials on how to teach English Language Learners. Unfortunately, their website is usually not working so you can’t download them from there. Fortunately, the manuals are available elsewhere. The two best ones are TEFL/TESL: Teaching English As a Foreign or Second Language and Teaching English As A Foreign Language To Large, Multi-Level Classes. 8 guaranteed ways to enhance teenage learner motivation in the language class is by ELL educator Adam Simpson and, if you’re a teacher of English Language Learners, it will really be one of the most useful posts you’ll read this year. The “Topics” page at Learning English For Kids at the British Council is a gold mine. CLEAR from Michigan State University has gold mine of free online applications for use with ELL students. Q & A Collections: Teaching English Language Learners is the headline of one of my Education Week Teacher columns. It contains links to all my Ed Week posts on teaching English Language Learners from the past five years – in one place! I use Film English, and my young adult students really enjoy the short films, and happily complete the suggested activities. Many thanks for including my “Are you a Good Language Learner” questionnaire in your “All time best resources’ – a great honour to be up there with all these great resources you have listed.